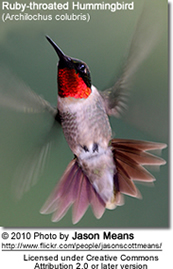 The Ruby-throated Hummingbirds and the Rufous Hummingbirds are amongst the most common hummingbirds in the United States. They occur in nearly all U.S. states and occur side-by-side over much of their ranges. As they have many physical commonalities, they are easily confused. 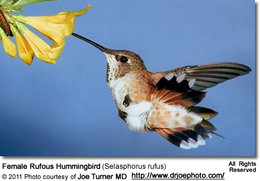 Female Ruby-throated Hummingbirds resemble the Rufous Hummingbird females. However, the female Rufous Hummingbird can be identified by the green feathers that cover her back and crown (top of the head). Males also look alike, but they can be identified by their different throat colors (ruby-red in the Ruby-throated and orange-red in the Rufous Hummingbirds. 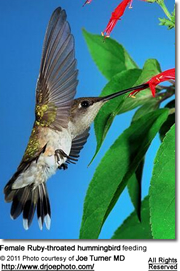 The male Ruby-throated also has a slightly forked tail (not pointed as it is the case in the Rufous Hummingbird). 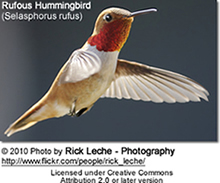 The Ruby-throated is a little smaller than the Rufous Hummingbird. Please refer to the below photos .